Only about 5 percent of the world population has ever flown. This minority, which flies more and more often, lives mostly in industrialised countries. The consequences of climate change, however, primarily affect those who have contributed little to it, i.e. people in developing countries. About 2.4 billion people live in rural areas and depend directly on agriculture and thereby on climatic conditions for their livelihood. Climate change that causes natural disasters, such as increasingly frequent droughts and storms, represent a direct existential threat to these people. Every 30 seconds a child dies from malaria. Among infectious diseases, malaria is the second most common cause of death. Increasing temperatures will allow malaria to spread into new areas. Rising sea levels not only threaten beautiful sandy beaches, but above all endanger the homes and livelihoods of many people in coastal areas. 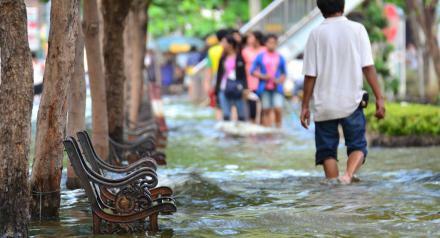 In the Philippines, 17 million people are already exposed to the risks of floods and encroaching salt water. Experts prognosticate a partial sinking of Bangladesh due to coastal flooding and rising rivers. In the long run, small island states, like Tuvalu in the Pacific, are likely to disappear completely.